We really care about our patients, and it shows from the moment your step across the front door threshold. 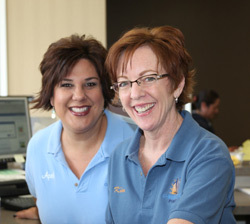 When you walk in for your first visit, you will receive an amazing greeting from our staff. You will be taken on a tour of the office to help you get acquainted with us. Then you will fill out some short forms—unless you have already done so! We usually e-mail these forms to our new patients, so you can fill them out before you come in for your first appointment. Next, we will invite you into a consultation room, where one of our practitioners will talk to you about the reason for your visit, gather a bit more information about your health history and background, and then conduct a complete examination which includes a full posture check, spine examination, and a nerve scan (which measures nerve and muscle tension around the spine); if necessary we will also take a set of full spine x-rays. Finally, you will meet with one of our doctors to discuss your recommended treatment plan. We never require you to do anything. Rather, we offer you options based on our recommendations, which are based on our experience and knowledge of current medical science. We can also offer a “next best” recommendation for your consideration. It is up to you to make the decision about what strategy to follow based on our findings and input, your situation, and what you are willing to do. All Chiropractic First patients are required to attend our Health 101 workshop within the first two weeks after their first visit, so that they can learn what is possible for their health and their lives. In this dynamic workshop, you will learn about the five factors of health, and you will begin to change your thinking about how to manage your well being. You will also learn about the role that chiropractic care can play in your life and the lives of your family (from infants to seniors). What can you expect from your visit to Chiropractic First? A fundamental shift in how you think about your health and your life, and a partner in making sure you are living optimally!